Whether you have just invested in your dream renovation project or you simply need to do some DIY, Lakeside-Hire can offer you the best advice on the using the right equipment for the job. If you are carrying out work at height don’t reach for your old ladder, hiring a scaffold tower is a far safer, more convenient, option. 4.2m External – This scaffold tower is used for projects on the exterior walls such as painting, window replacement and gutter repairs. How Does It Differ From Scaffolding? DIY scaffold tower hire is easy, a scaffold tower is an easy to erect, free standing structure made of aluminium which offers a secure work platform, a perfect tool for undertaking DIY jobs at height. It is not to be confused with scaffolding, which usually arrives on the back of a lorry and needs a team of professionals to assemble it. A scaffold tower may not be able to reach the same sort of height as scaffolding but it is perfectly adequate for DIY at the domestic property (about 5.2m), it is simple to put together and uses a basic colour coded brace hook system so you know it is assembled securely. All the scaffold towers come with a simple user guide and can be put together by a beginner in under an hour. Lakeside Hire doesn’t put the scaffolding together for you but there is no need, it is a simple two-man task which is far more cost-effective if you can do it yourself. 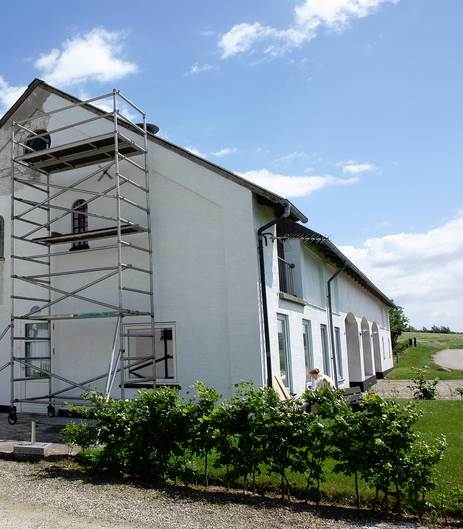 A scaffold tower is the perfect choice for domestic purposes and DIY because, unlike scaffolding, the height of it can be adjusted as you go along to fit in with a variety of tasks. Because Lakeside-Hire guarantee next day delivery so you won’t find yourself having to stop work while you wait for the scaffold tower to arrive. Paying for your scaffold tower hire has never been easier. A credit card payment will act as a deposit while you are using the equipment. We only supply branded equipment of industrial quality, the same type used on construction sites around the country so you can have full trust that your tower is safe to use. Towers are simple to erect and use but if you find yourself in a pickle simply call our office and you will be connected to one of our fully PASMA trained team memberswho will be happy to help. Q. What is your minimum hire period? A. 1 week. The prices above are for a full 7 day hire period. Be careful when comparing rates. Some hire companies say 1 week but mean 5 days. Q. How long do I have to hire for to get free delivery?